1. To prepare the poached barramundi, take oil in a pan, add yellow curry paste and sauté. Add turmeric powder and stir, then add coconut milk. Add bruised lemongrass and allow it to simmer. Finish with fish sauce, sugar, and the fish fillet and allow it to poach. 2. To prepare sambal prawn, heat oil in a pan and add chopped onion and garlic, and sauté. Add prawns and fried and cooked eggplant and then sauté further. Stir in diluted tomato paste and chilli sambal. Finish it with sugar and fish sauce and toss with spring onions. 3. 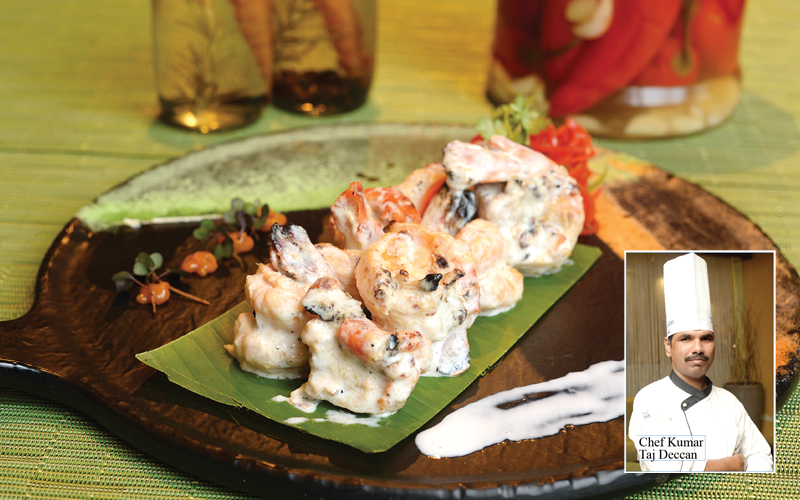 Mould the prepared prawn sambal in a three inch wide ring mould, in a deep paste plate. Top it with the poached fish fillet and pour the reduced curry on the side. Garnish it with salad of mixed mizuna leaves, basil sprigs, and coriander sprigs. 1. Wash the prawns in cold water, drain and put them in a baking dish. Take a large bowl, add the fresh cream, ginger, red chilli powder, oil, garlic, turmeric, lemon juice, and salt and mix well. Then add half portion of the mixture of spices on top of the prawns. 2. Keep it in the refrigerator for 50 to 60 minutes so that the prawns are marinated well. Grill the prawns in a charcoal grill or bake in the oven at 176°C for five minutes. Once cooked, put the prawns on a serving plate. Serve it hot with mint chutney and fried onion on the side.